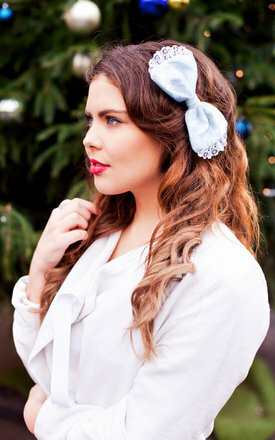 Beauxoxo's velvet hair bow clips are the perfect hair accessory inspired by my love of the Victoriana, Gothic trend. My velvet bows are a timeless hair clip, hair accessory and look beautiful with a half up style, loose waves, or to complete an up-do. Available in 16 stunning jewel tones. PRODUCT SPECIFICATION: My velvet bows are made with a gorgeous velvet fabric with a lace trim and fitted with a french barrette at the back. The width of the bow is approx 14cm.